This photo was taken on May 9, 2017 at 7:02 AM. The "Take It!" came as I was driving by a construction site that has a building immediately next to the excavation being done. 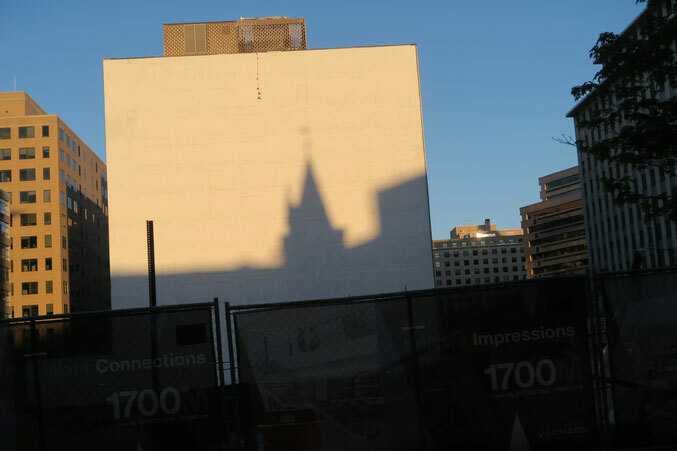 This next door neighbor had painted or coated its side wall facing the project with a light color that just happened to lend itself to being the "canvas" for this shadow from across the street. I had to quickly take out my camera, drop the car window and take the shot - just as the traffic light changed and cars began to move. A lucky photo for certain. The After Take: All who looked at this one in my camera viewing screen enjoyed it. The story of the quick take, was fun to relate. Thanks for joining me in the fun of this game of always being on the lookout for shareable images. I was going to say great sunset photo then I noticed the time. So, great sunrise photo lol.. It really goes look like a fresh canvas. Call the city and tell them to paint the building across the street on it. They already have an outline for it. This is a very pretty picture. The shadow against the blank wall really does a lot for it!